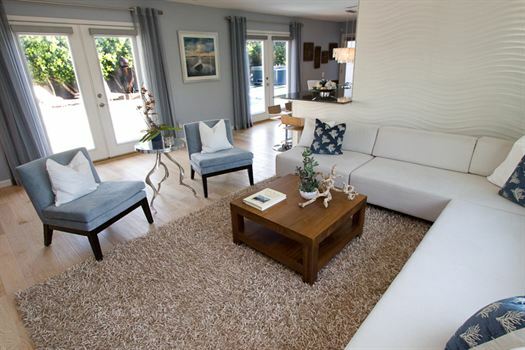 Fully renovated ranch style modern home with a warm beach feel. 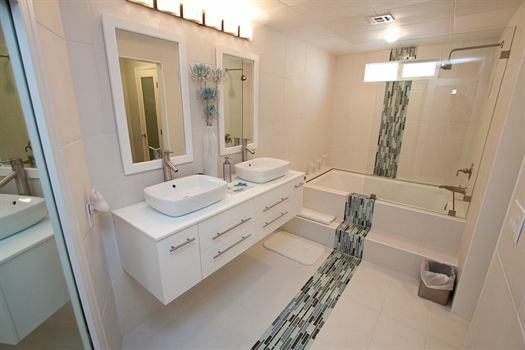 Located in North Palms Springs off Palm Canyon Dr., this house is only minutes from downtown. 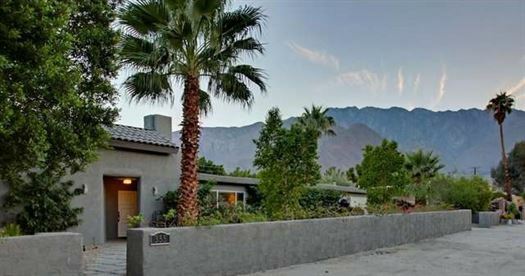 This immaculate retreat has hardwood floors throughout and an open floor plan with 4 sets of French doors that open up to the sparkling pool, spa and gorgeous views of the San Jacinto Mountains. 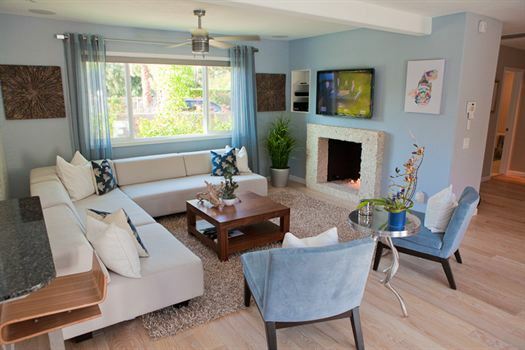 "Palm Canyon Retreat" features indoor and outdoor fountains, soft shag rugs, sheer draperies, motorized shades, a decorative tiled wave wall and a stone/glass gas flame fireplace. 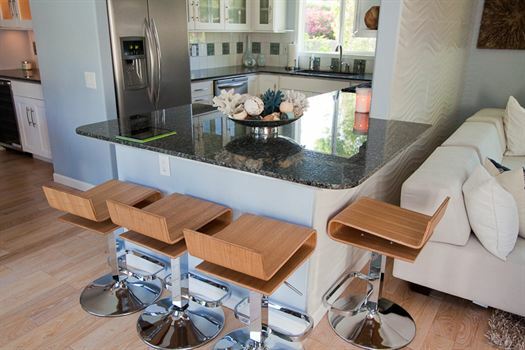 Built-in speakers are featured both indoor and outdoor, to enjoy music throughout. 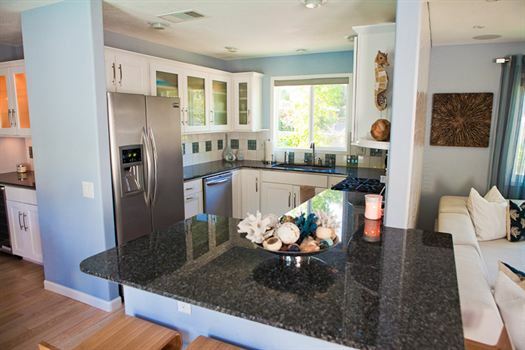 The gourmet kitchen and adjoining wet bar features granite counter tops and stainless appliances with a breakfast nook that seats four and looks out into the open living room. 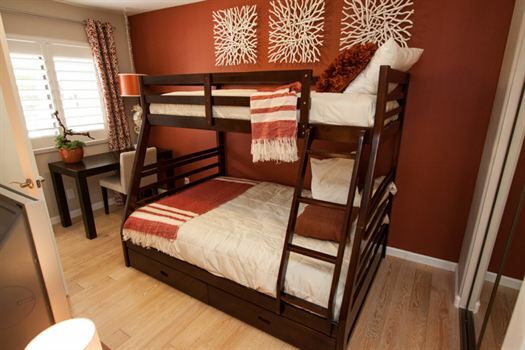 This home has 2 master suites with king beds and a third bedroom with a unique bunk full/twin bed. 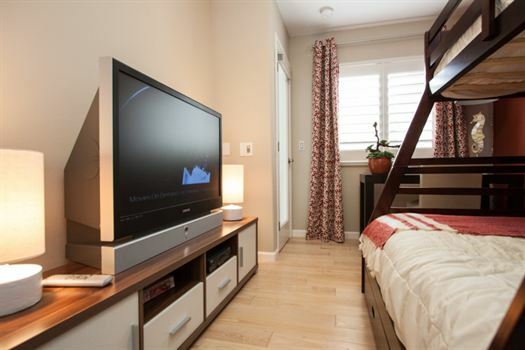 All 3 bedrooms feature en suite bathrooms, blackout shades, WIFI, flat screen HD TV's with cable and DVD players, luxury linens & bedding, and beautiful tiled bathrooms with modern fixtures and rain showers. 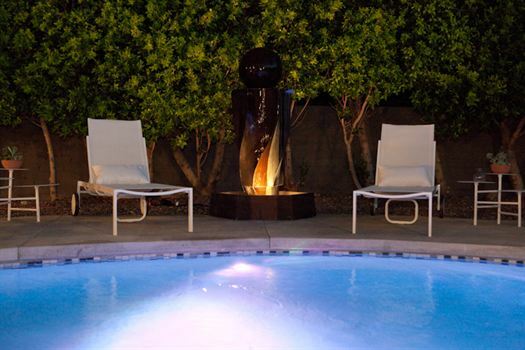 Backyard features include umbrellas and outdoor furniture that surround the sparkling pool and above ground spa with LED lights, fountain and built-in stereo. To view rates for your stay please click on the GET QUOTE button. Special event and holiday rates may be higher and minimum nightly stay may apply during February - April. City tax 11.5%. Pool heating optional with an extra fee. Cleaning fee required. Refundable damage deposit required. 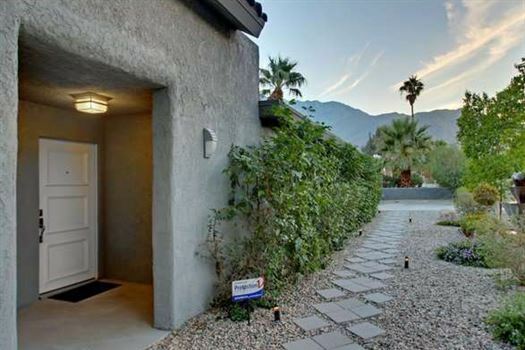 Downtown Palm Springs about 1.5 miles, quick drive to restaurants, grocery shopping, parks, 10 minutes to Palm Springs airport, 5 minutes to Palm Springs Aerial Tram. We had three adults and two children in our group and this rental gave us all adequate space to feel comfortable. The kids enjoyed the bunk beds with their own bathroom. 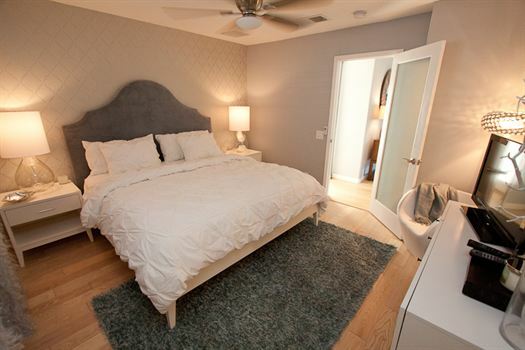 The other two master suites were very roomy and comfortable with their own bathrooms also. 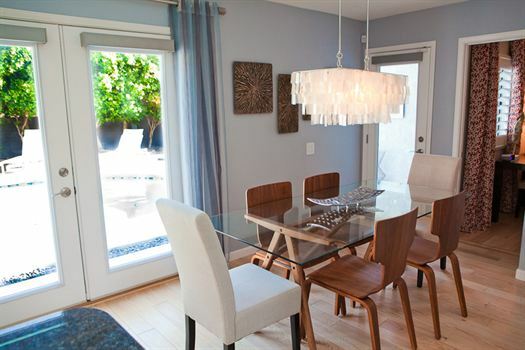 The kitchen and dining room areas were very modern and inviting. The outdoor pool and hot tub were fun and got a lot of use. We had a minor hold up checking in since housekeeping had not left a key in the outside key box, the living room TV required some extra assistance from Christopher to get working, and several outdoor lights around the pool need replacement which we discovered while grilling one evening. Overall, we received prompt assistance from Eva, Christopher and Eric when we had concerns. 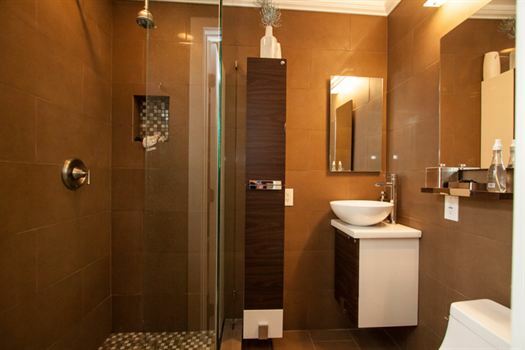 The property was roomy, modern and well situated around the pool in the backyard. 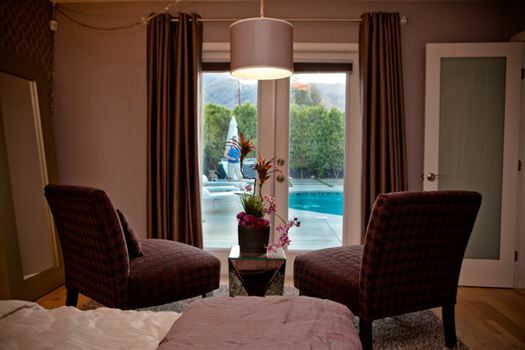 I would definitely use Oasis Rentals again for my next stay in Palm Springs. 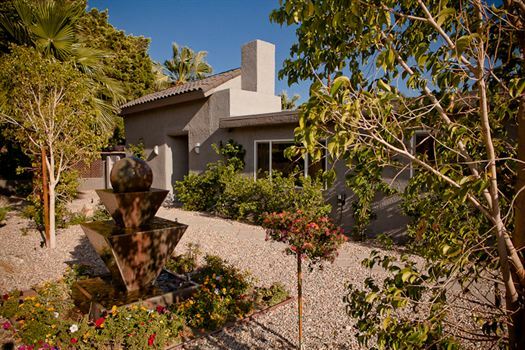 Palm Canyon Retreat was an ideal house for our kids and grandkids to share time together. The pool and hot tub were well utilized every day. 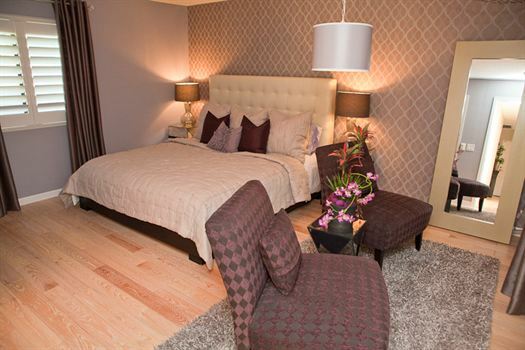 The house was well equipped, very nicely decorated and the beds comfortable. The location was on a very quiet street. We had a couple of minor issues which Eva and the Oasis team responded to quickly. Overall we enjoyed our stay and the house worked really well for our family. One suggestion for consideration is to add a larger patio table and chairs so it's possible to eat meals outside. Currently there is a bistro size table which seats only two people. 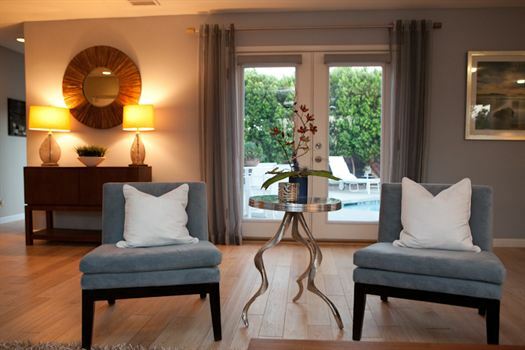 I would definitely recommend Palm Canyon Retreat and Oasis Rentals. 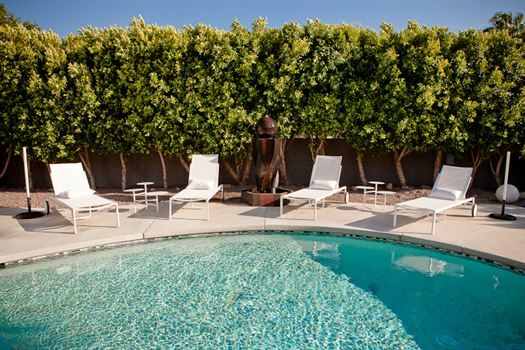 Palm Canyon Retreat was ideal for a relaxing holiday. 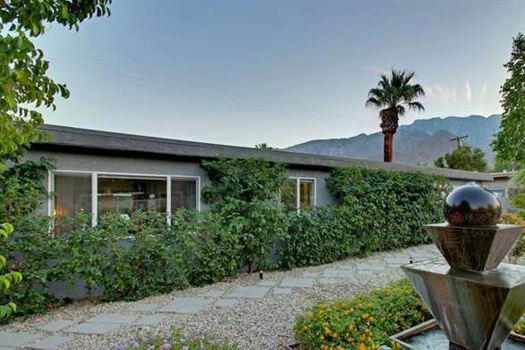 In a quite area and a short drive from the center of Palm Springs. It was very well equipped, clean, well decorated with a good pool and hot tub. WiFi excellent. Oasis staff, especially Eva, were very helpful. I can recommend this property & Oasis. 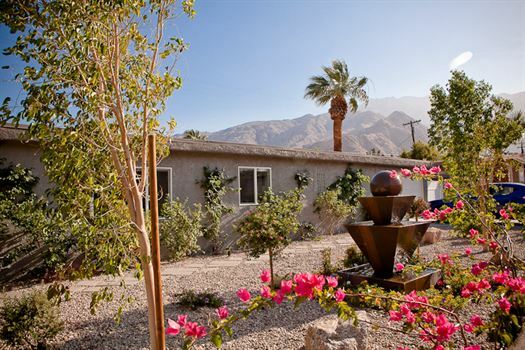 Our group of four adults, 2 toddlers, and 1 dog had a great stay at the Palm Canyon Retreat. The home was spotless and well stocked with kitchen supplies, sheets, towels, you name it. We also loved that each bedroom had its own ensuite bath. The staff at Oasis rentals was great to work with and made sure we felt at home. We especially loved the quiet neighborhood and street- we were able to fly kites outside one windy morning! The property is also very close to Victoria park which has a wonderful playground for the little ones. What a great experience! We booked our place at the last minute but it was completely worth it. The house was exactly as described on the website and had even more to offer than expected. Checking in was super easy, the house was gorgeous (pool and hot tub were used the whole time), and we would definitely come back. Thanks go to Christopher for such a warm welcome! Celebrating New Years in Palm Springs may be our new thing. Our family wanted a quick get away destination and this was the perfect place. 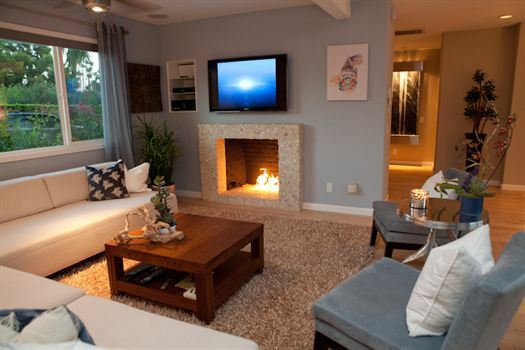 The home was gorgeous ~ beautifully decorated with modern décor and cool colors. We were able to enjoy the private pool, grill out and just relax. The home had everything you could possibly need, truly the comforts of home. It is located just minutes away from downtown where we enjoyed Villagefest on Thursday night (a must for those who have never been). 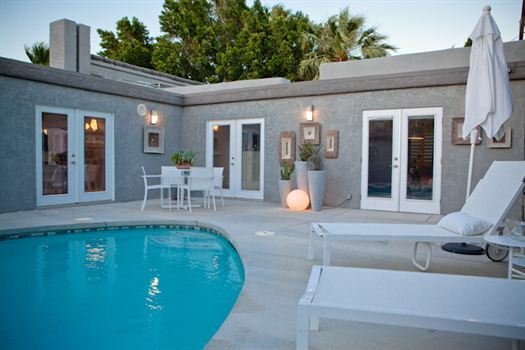 If you are looking for a place to stay in Palm Springs, I whole heartedly recommend this one! This home was amazing. Much nicer than the pictures. Beautifully decorated inside and outside. 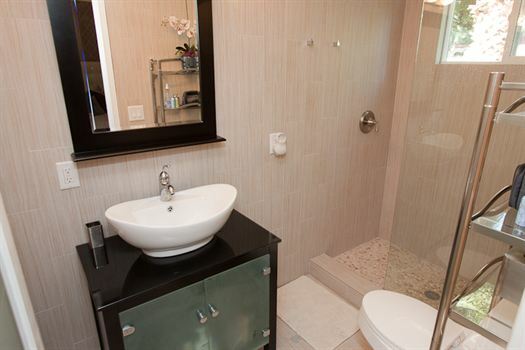 Very comfortable with all the amenities of comfort and relaxtion, including the quiet private backyard with pool and spa. I would recommend this to any couple or a family . 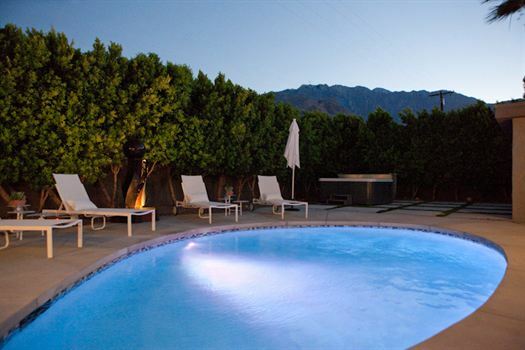 The price was very reasonable for the upgraded accommodations and location to downtown Palm Springs. What a special house. 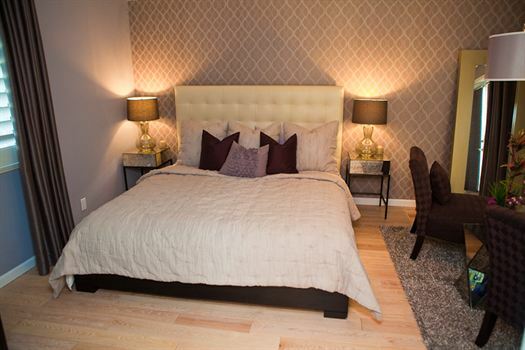 So tastefully and comfortably furnished. We had a fabulous week and Oasis representative, Chris was efficient and very welcoming. 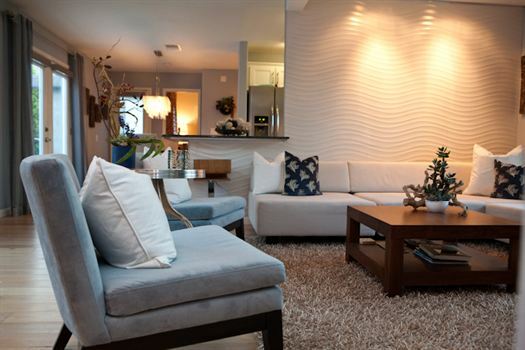 Great home that is quite comfortable for 2-4 people. The multiple doors opening to the back yard and pool make the home seem even more open. 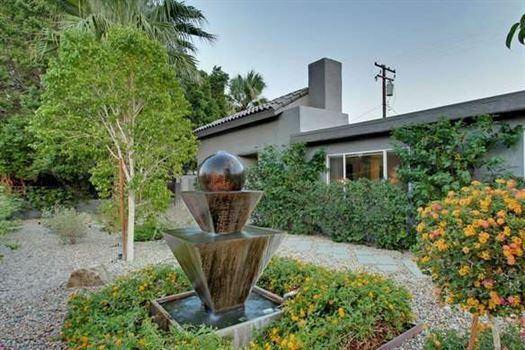 The location is north of town, but only a couple minutes away from downtown Palm Springs. I can honestly say that the rental property and the service was OUTSTANDING!!!! I had no issues whatsoever and my stay was perfect! I was able to get through to a staff member every time I called and they responded quickly to each request made. My security deposit was returned in a timely manner with no issues. The property was Gorgeous!!! It was better in person than in the pictures and I loved the feel and decor of the house. No detail was spared...it was everything I pictured and more! Overall we were extremely happy and satisfied with Oasis Rentals and will use them in the future no doubt!!! !